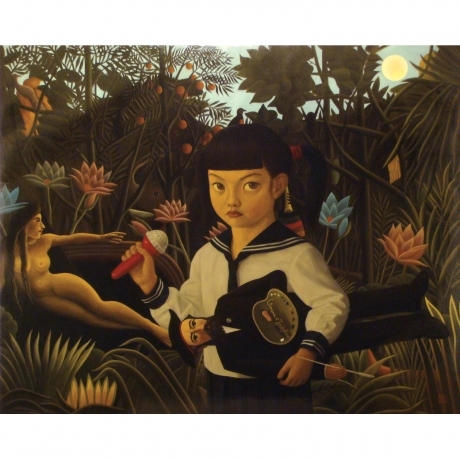 Mitsuru Watanabe (Japanese, b.1953) preserves the childhood of his daughters Naoko and Yukiko, in surroundings inspired by Rousseau and Delvaux. The result – a combination of reality and make believe in a surreal place where it looks like the children are in their own imagination (or playground). I was reminded of my own dreams where odd things were going on in the background while it seemed like a normal day; Like it was possible that I was crossing the street with monkeys and walking to work through a tropical forest or flying (arms flapping – not by a plane) to meet my friends for coffee at a shop where the barista had a snout. How odd! Things do become more fun if we imagine our surrounding looking like a zoo and if you replace your office arch nemesis’ head with a cow head with pig ears. 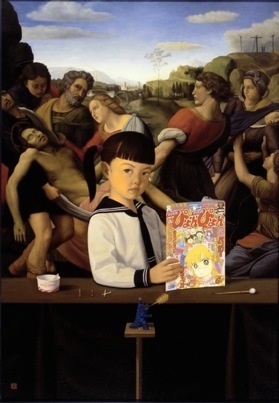 Back to Watanabe – the paintings are oil on canvas and mounted on panels. When up close, I had initially thought that they were oil on panels itself. The pieces are flat as a paper, glossed up with a smooth texture, that of a photo. Naoko and Yukiko looks at you in each painting, almost asking “yeah so what?” – They look like edgy little girls who will not be pleased at getting their cheeks pinched by doting adults. But it could also mean nonchalance to the environment where they are placed (in the painting). The children’s straight faces and look of boredom are ironically very intriguing. Against the contradicting backgrounds, the paintings draw you to look further, to “see” closely what is going on. Intense colors bring out the images, but the effects used for the background, and on the little girls are different. The children are painted in more contemporary flattish tones, but the backgrounds are a little more classical. Perhaps that is how Watanabe is able to create the mystique in each piece. I try to envision vast imaginary landscapes fenced in by proper nouns of such painters as Rousseau and Delvaux as semi-realistic public spaces. My daughters travel to these places, where they pick flowers, take a short nap and play. In the world of imagination, everything is accessible and nothing is forbidden. I observe other painters’ images from a landscape painter’s point of view and play with those images. The self is not a closed system fenced in by a name. It is a unique place where information of all sorts flows, mingles and transfigures. The same applies to works of art. In a work associated with the name, Raffaello, da Vinci and Michelangelo mingle and transfigure. The forest landscape of Botticelli’s tranquil Primavera, from which the nymphs disappeared, is freed from the painter’s name. Rousseau’s forest transforms as hours and years go by. I spend my days working, thinking of such landscapes. 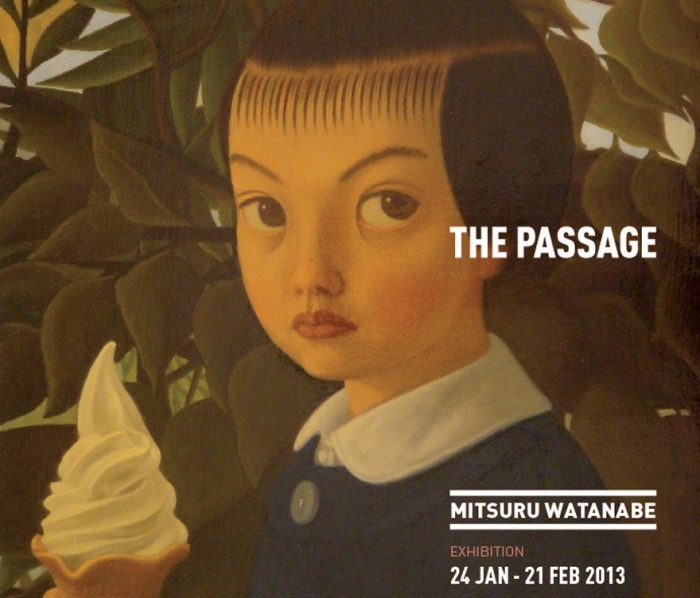 Tomorrow, a-Gallery will official launch the exhibition of Watanabe’s works, where Yukiko and Naoko take centre stage. We were lucky enough to see the works last weekend when gallery hopping in Soho. Nevertheless, I will pop by at the event and hope to see if the girls will grace the event, hopefully they can share what they think about walking through Rousseau’s forest. 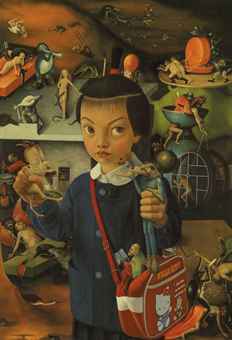 Posted on January 23, 2013 by ChalkandRaddyPosted in Visual ArtTagged a-gallery hong kong, Art review hong kong, Japanese Artist, Mitsuru Watanabe. Previous Previous post: What's Brewing?